College of William and Mary, B. 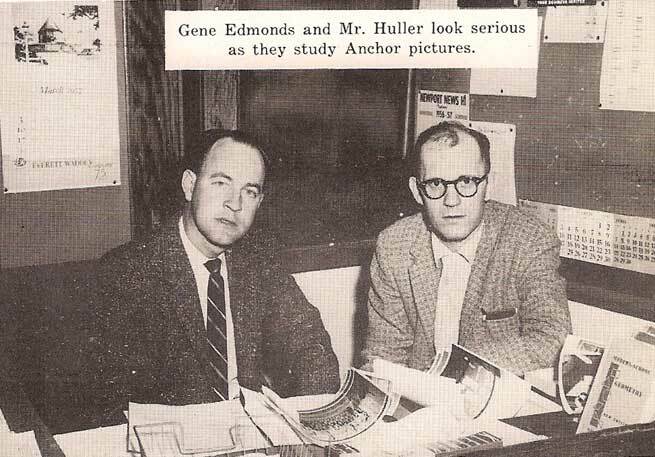 A.
Gene Edmunds (sic) and Mr. Huller look serious as they study Anchor pictures. Here is an interesting tid-bit. The June 6, 1957 edition of The Beacon featured an article entitled the "Roving Reporter"
in which the reporter asked the following question: "What will you remember most when you leave NNHS?" Among those interviewed was Nancy Timberlake Spencer ('57) of VA who answered: "Quarreling with Mr. Huller." Now we know why Mr. Huller lost so much hair during the 1953-1957 period. This is timeless and reflects the sentiments of most if not all TYPHOON that read your Newsletters. 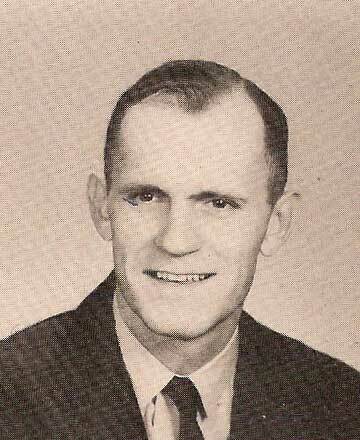 This farewell editorial is written in the form of a letter from Mr. Huller to his son, Jerry. I am taking a leaf from the pages of Drew Pearson in writing you this letter. you will be graduating from Newport News High School. I want to tell you some of the things that you will encounter during your high school days. I have had the pleasure and honor of being both a student and a teacher at NNHS. that you will meet anywhere. Your high school days are the greatest, and I hope that you will enjoy each one of them. One of the greatest privileges that you can have is to say that you are a graduate of NNHS. As I said, this is fourteen years away, but those years will fly by. Make the most of every moment. Son, if you enjoy your days in NNHS as much as I have, you will be living a very happy life. at a “This is Your Life” tribute to Ethel Gildersleeve and later forced the details from my Dad. WOWZERONI!!! Thanks so much, Dave! We are delighted to have this information! Greetings to all my former students. I think of all of you often. NNHS was the best school in the nation at that time and had the best student body! It was most enjoyable for me and I loved every minute of it. I turned 80 in September 2005 and I am now considered an old geezer. I retired from Walt Disney World after 25 years of service. When I retired, I was General Manager of Special Events in all four parks. Some of the functions that came under my Department were Christmas, Easter, Candle Light Ceremony, Grad Night, and opening of all the parks including international openings (Tokyo, Euro-Disney). One of my biggest projects was preparing the Millennium Celebration including various locations in Florida and South Carolina. My Department was responsible for building all the stages and props that were used by the entertainment division. In my job I met many celebrities including Tom Cruise, Kevin Costner, Carol Burnett, Dolly Parton, and Presidents Nixon, Bush (Sr.), and Reagan. But my favorite was Vanna White. We became very good friends and I consider her a very nice young lady. In regards to Evelyn Casey Sneed’s ('57 - of VA) question, I left NNHS in 1959, went to the Newport News Shipyard, and from there to Disney World, so I have had three great careers during my lifetime. Evelyn, Gene (Edmunds) and I picked the “dawn beauties” on the basis of character and looks. Journalistic abilities had nothing to do with it. And to Harry Covert ('57), I am glad you have done so well in the world of journalism. come by and see me. I wish all of you’ll a Happy Thanksgiving and a great holiday season. in the Newport News public school system. We were fortunate to have so many other outstanding teachers. They set examples that have stood each of us well. When I think of heroes I think of him. I don't know if you would be interested in adding this to Mr. Huller's page or not. I received it from a classmate back in September 2009, which was a bit after the fact. I thought it was such a detailed synopsis of his life as seen by his sons and his very close friends. It's your decision. John Alvin “Scooter” Huller lived and breathed Disney. He left a job where he built nuclear aircraft carriers in Virginia to joined Walt Disney World in 1979. Huller of Orlando started in a gift shop at one of the resort’s hotels, making less than $3 an hour. But he quickly worked his way up to special-events manager, where he stayed for nearly two decades. Huller died Wednesday at Florida Hospital. He was 83. ”He put in five years worth of overtime at Disney — he loved it so much. . . .You could have paid him nothing. As long as he had a place to sleep and you fed him, he'd work there for free,” said son Dave Huller, 50. His father didn't retire until he was 74. Even after retirement, he returned to the park regularly to meet with former co-workers and bring his grandchildren for a visit. Huller was born in Newport News, VA. He graduated from the College of William and Mary and returned to his hometown to teach math and English at the local high school. He taught for eight years before moving to the shipyard, where he worked in the atomic-power division. But he always dreamed of working for Disney. He let his family know every time they spent their vacation at the theme park. ”I remember riding the monorail and dad saying ‘I love this place — I'm going to get a job here some day,’ said Dave Huller of Rocky River, Ohio. ”It wasn't until 1979, seven years after his wife, Helen, died, that the senior Huller decided to abandon the shipyard and live out his “second childhood.” He quickly packed up his home and moved to the Sunshine State. At Disney, Huller was the one that made the “magic” come alive. He was in charge of setting up for events such as Grad Night and Good Morning America shows. He also supervised installation of the Christmas decorations and lights. ”When it came to matters of Disney, he was a perfectionist. . . .The workers might have perceived that as harsh. But in the end, they appreciated it,” said son Jerry Huller, 55, of Centennial, Colorado. Many people were intimidated by his gruff personality. He had high expectations for people because he knew they could achieve the best, said his son Mark Huller, 52, of Port Deposit, MD. That attitude may have come from serving in the U.S. Army during World War II, for which he received a Purple Heart. ”He'd get people to live up to those expectations,” his son added. Disney wasn't all work. He posed for pictures with many celebrities, his favorite being Vanna White from the game show, Wheel of Fortune. His walls at home were covered with autographed photos. ”He reminded me of Forrest Gump — he was there for every special event. He always had celebrities on his arms,” said friend Kitty Phillips, who worked alongside Huller for 13 years. Huller would tell stories about meeting famous people, such as Michael Jackson, said Phillips, who is the public-affairs manager at Disney. He also had pictures with his favorite Disney characters, including Mickey and Minnie Mouse, which he named his cats after. Dave Huller said they recently took down about 75 frames off the wall. ”In each of those, there was something related to Disney,” he said. Survivors also include his sister, Mary Poe of Colonial Heights, VA., and seven grandchildren. Absolutely! Thanks so much, Pat! 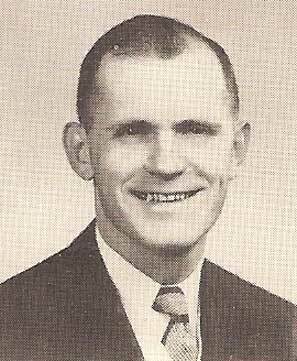 Mr. Huller always refused to divulge how he got tagged with the nickname "Scooter" when he would travel with the Men's Basketball Teams and keep stats. Even in my correspondence with him in the last few years, he denied my request...as thought he was keeping it a secret. Today, when Fred Hayman ('57) of VA met me in Lakeland, Florida to attend the Fun N Sun Air Show we were joking around and recalling our days as TYPHOON back in Newport News. During that conversation Mr. Huller came up and so I took the opportunity to ask if anyone knew how Mr. Huller got the nickname "Scooter" and Fred knew. Fred's father worked in the Shipyard, and before Mr. Huller became a teacher at NNHS, he work at the shipyard as well. Mr. Huller's duties in the shipyard required him to visit various sites in the shipyard in the course of the day. In doing so, he was assigned a Cushman Motor Scooter. The yard workers tagged him with the nickname by announcing his arrival at the various shops he would visit, as sort of a "Heads Up" for the other workers. The nickname stuck!!! Now we know the rest of the story. AHA! Let's hear it for solved mysteries! Thank you so much, Joe - and Fred!